Open early, and known for its breakfasts and bakery, this Trenton eatery was well populated on the holiday Monday morning we attended. Men in groups of two had the look of hard workers getting calories for the day ahead. There is a large population of Guatemalans in Trenton, NJ, and these were just a few. They keep it dim inside, with the blinds drawn on every small window. Most of the lighting is done by Tiffany-style lamps hanging from the ceiling, giving the place a very warm vibe despite the rest of the sparse surroundings. In a self-service station they have coffee, tea, and both atol de elote and atol de plátano ($3 each, pictured at bottom) in large heating barrels. These drinks of milk and corn and plantain, respectively, are served hot and enjoyed in any weather. 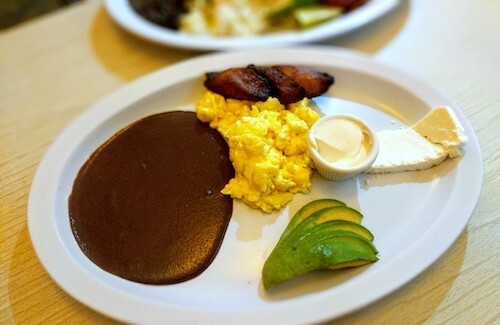 The desayuno chapinita ($8, above) is a meatless breakfast plate consisting of scrambled eggs, beans, cheese, and a sweet plantain. Central American meals are usually not complete without avocado, and the Guatemalan-style crema is key. 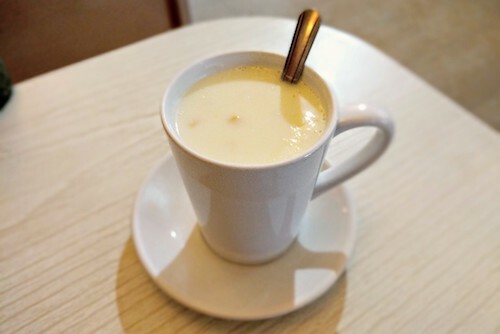 Atol de elote y platano, always at the ready. Despite only being two people and having already ordered two meals, a plate of garnachas ($6.99, above) could not be avoided. 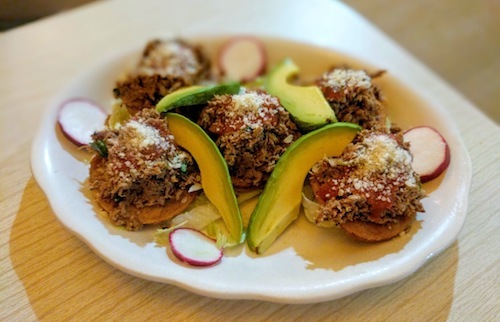 Different types of garnachas can be found in Guatemala, Belize, and southern México, but these versions are piles of shredded meat over thick crispy fried corn tortillas. Both the breakfast and the churrasco Tikal ($14, below) were served on plates nearly two feet long. While the breakfast items had plenty of room to maneuver, the meat platter was a comically large amount of food. There are not small two top tables here at La Chapinita, and suddenly we realized why this was. 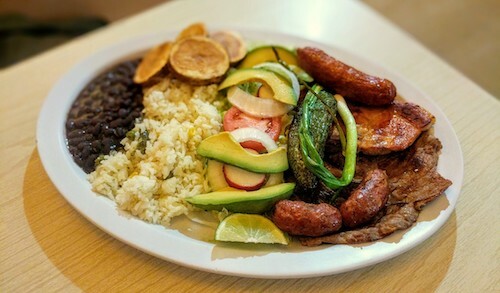 The plate is populated by carne asada, a pork chop, and two different types of sausages. Along with black beans and rice, a salad with plenty of avocados, and some fried potatoes, a meal for a small family was ready to be eaten.